It’s been almost month since we released our TITO Vs Carded Gaming poll and the results are in! 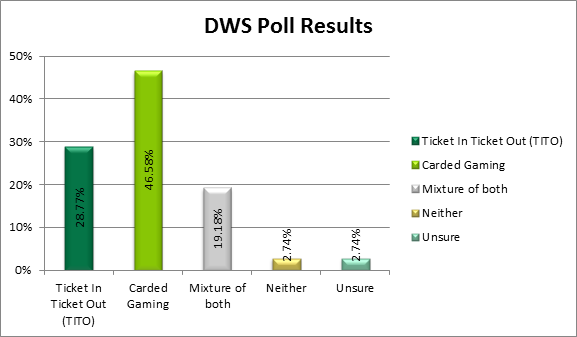 Out of 73 respondents, an overwhelming 47% of you prefer using Carded Gaming within your venues, given the option. While preference for the TITO system trailed behind at 29%, this alternative gaming system appears to be evolving with time and the introduction into venues. There are many benefits to both systems and venues are encouraged to research both options prior to any commitment. Each system will require time and training to implement and any confusion along the way could result in player/staff dissatisfaction if not implemented effectively. For a thorough examination of the results or an independent review contact Danny Nixon-Smith on danny.ns@dws.net.au or 0433 906 809.